Frank Lampard has gone. He announced that he will not extend his contract at Stamford Bridge at a training camp in Miami. Frank signed for us in 2001 for £11m from West Ham, many rubbed their eyes in wonder at the size of the fee – £11m was a lot of money at the turn of the century kids, now it is just a banker’s loose change – and he had his critics in his first season but he has never looked back. Bought to replace both Dennis Wise and Gustavo Poyet he made 649 appearances for Chelsea and won 11 major honours including three league titles and a European Cup. His 211 goals will stand in the record books for almost as long as Bobby Tambling’s record of 202 that was broken only last season. For England he became the first Chelsea player to win 100 caps whilst playing for Chelsea scoring 29 goals. More than that he was a calm, intelligent presence around the place. Whatever scandal the tabloids wanted to surround the team with, Frank was always a steady, sensible voice. He will be missed at the Bridge, more than we can really appreciate now. The hole will be there in midfield next season. Marco van Ginkel, or perhaps Lewis Baker have very big boots to fill. Meanwhile, Andre Schürrle made the Germany squad and Omeruo, Moses and Mikel all found their names pinned up on the Nigerian list. At the England press-conference in Miami Frank Lampard talked bout how difficult it had been to leave Chelsea. He singled out Munich as his highlight – who wouldn’t – and he dropped a big hint that the north American MSL would probably be his choice after the World Cup. Our number 10 next season will be Eden Hazard. He has been wearing 17 on his back but takes over the coveted number in part to persuade him to ignore PSG and play a more central role at the Bridge. Anyone who wants to trade their no. 17 shirt for a new one will just need their receipt, or, given the cost of the damned things, their mortgage documentation. Eden was included in Marc Wilmots’s Belgian squad along with Courtois and Lukaku. Meanwhile, on a quiet day for friendlies, Willian scored for Brazil in a 4-0 humbling of Panama. Oscar, Ramires and David Luiz had all started the match. England’s group opponents Costa Rica were beaten 1-3 by Japan. An entertaining international friendly is a rare beast but England’s youthful attacking verve allied to incompetent defending made for a night of close calls and near misses in a nearly deserted Sun Life Stadium in Miami. Alec Oxlade-Chamberlain buzzed around looking the class of the field before getting injured. He will need scans to assess the damage to his knee. Ross Barkley stood out on a night when both Jack Wilshire and Frank Lampard were caught up field and the defence of Milner, Jones, Smalling and Shaw looked at sea. Raheem Sterling even managed to get a red-card, it was that kind of friendly. Oddness around in Belgium where their Luxembourg friendly has been written out of the record because they used more than the permitted number of substitutes. So, Romelu Lukaku didn’t score a hat-trick and Manchester United irritant Januzaj didn’t make his debut. 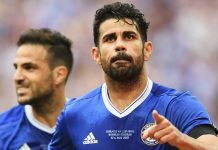 Diego Costa has passed a medical at Chelsea, if you believe all the inside sources, and is now just negotiating personal terms. Jamal Blackman signed a new five-year contract by which time we will all officially be old and grey. Andre Schürrle scored the opener as Germany beat Armenia 6-1 in a warm-up. Meanwhile Branislav Ivanovic’s Serbia slowed Brazil down so much they were booed off after winning only 1-0. Luiz, Oscar and Willian all played some part. Nemanja Matic also played for Serbia. Chuffing thunderstorm was the most entertaining thing about this match as the wrong team started and the side only came to life when Ross Barclay and Jack Wilshire came on. Hodgson will pick the wrong pair next week and we’ll be eliminated as he tries to get Jordan Henderson and Steven Gerrard to work as a midfield. Hodgson is fond of saying that he doesn’t just pick his side on the prevailing mood but he clearly picks them based on whether a player is at a big club and who is catching the headlines. Henderson’s place is a product of the latter and the persistence with Danny Welbeck the former. Welbeck is in the side because he plays for Manchester United. That he is a mediocre footballer who had a poor season in a forgettable side is beyond Hodgson who looks at the badge he wears and not the performances he puts in. England will pick the wrong players next week and stand still and watch while Italy destroy us. We’d like to be more positive but Hodgson’s England have always been poorly picked, organised and led. We should do a few jokes about Roy Hodgson’s dress sense but we think modern football audiences are too young to remember Don Estelle. In Brussels Belgium’s preparations for the heat and humidity of Brazil was interrupted by hailstones. Their match with Tunisia was held up while the storm passed. Romelu Lukaku limped out with a bruised ankle, he should be recovered by next week. Belgium won 1-0 thanks to a late strike against ten-men. Victor Moses scored a penalty consolation as Nigeria slumped to a 2-1 defeat at the hands of the United States of America. The Super Eagles have themselves to blame as Obi John played only the first-half and Ken Omeruo sat on the bench. Forget all the World Cup hoop-la, hoo-ha for a minute – Jose Mourinho coached the Rest of the World to a thumping 4-2 victory over England in the annual Soccer Aid match at Old Trafford. He tripped gurning champion Olly Murs into the bargain.